On the Journey...: I'm in Tennessee! I am now in Tennessee for the Selection Camp--basically phase two of the the process that will choose the Olympic Team. Phase one was Olympic Trials, which took place in Indianapolis, Indiana a little over a week ago. Trials was for me…a little up and down. I made some mistakes, and I did some things well. I ended up in second place. The best part of the week for me was to have so many of my family and friends there to support me. They truly are a blessing—especially my wonderful husband. Although trials was a very draining week in many ways, I am feeling rejuvenated now and excited and ready to compete this week. Here I will compete my individual dives again 4 times, and my list of synchro dives 4 times with my synchro partner Cassidy Krug. I compete on Thursday the 3rd and Saturday the 5th. I am trusting God to give me what I need one day at a time. He has been so good and faithful to me, and my biggest goal for this week is to keep my eyes on Him and enjoy this next step of my Olympic adventure. 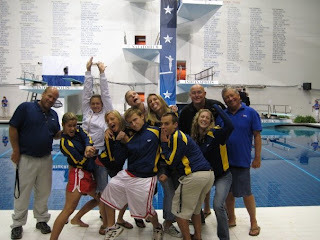 Here is a fun pic of my team at Trials. I love them!